HAMPTON, Va. (August 15, 2018) — Hampton University and Goodman & Sons have teamed up to offer two exclusive Hampton University Pandora charms. The two select charms contain a picture of either the Emancipation Oak or the Memorial Chapel, with both donning the Hampton University logo. Each charm is hand-finished sterling silver jewelry and costs $85. 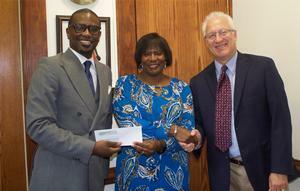 Fifteen percent of the proceeds benefit the Hampton University Proton Therapy Institute (HUPTI). The Hampton University Proton Therapy Institute utilizes proton therapy, delivering effective, focused radiation treatment for a multitude of cancer types. Proton radiation is noninvasive and only lasts about a minute for each session, allowing many patients to continue leading their regular lives with few challenges. 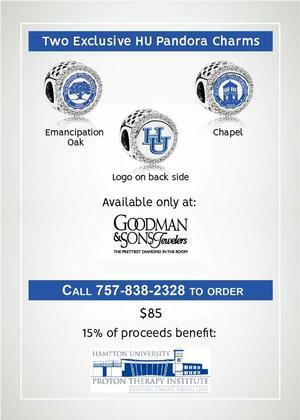 The Hampton University Pandora charms are now available for purchase and are only available at Goodman & Sons Jewelry. Call 757-838-2328 to order yours today.